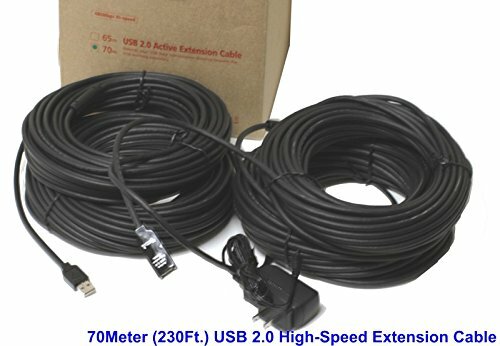 This 200 foot long USB 2.0 extension cable allows you to extend both USB and USB 2.0 cables with ease! It has a second male USB plug to give extra power, all the way up to 300ma of power a the end, that will power most USB devices. This product also features a power LED indicator and includes an AC Adapter plug to give extra power, all the way up to 500ma of power a the end, that will power most USB devices. The USB Active Extension Cable is not a passive cable. It has a patent pending ASIC chip inside that buffers the incoming and outgoing USB signals. Passive cables have the risk of data loss because they cannot pass the signals efficiently. The Active Extension Cable acts as a single port hub, increase the distance between your computer and USB devices. The cable meets USB specifications and works with low-speed and high-speed devices. If you have any questions about this product by Gearmo, contact us by completing and submitting the form below. If you are looking for a specif part number, please include it with your message.